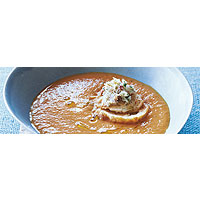 This fantastic soup meets all the requirements for a healthy but comforting starter. It's a flavour-packed blend of ripe tomatoes, cucumber, red peppers, garlic and herbs, served hot. Croutons piled with shredded crab meat give a special-occasion feel that would make this dish ideal for a dinner party, but just leave them out if you want to make a simpler version. Pour the stock into a large saucepan, bring to the boil and bubble for about 5 minutes until reduced by about half, then set aside. Slice the bread very thinly into 12 slices and grill until pale golden on both sides. Prick the base of the tomatoes with a sharp knife and place in a heatproof bowl, cover with boiling water and leave for 2 minutes or until the skins start to split. Drain, peel and halve the tomatoes. Add to the pan of stock, together with the cucumber, peppers, garlic and 1 tablespoon of the coriander, and heat gently until simmering but not boiling. Cover and cook gently for 15 minutes until the vegetables are very soft. Stir in the sugar and oil. Blend the soup, in batches, until smooth and return to the cleaned pan. In a bowl, season the crab meat with black pepper and mix in the remaining coriander. Ladle the hot soup into bowls and drizzle with a little olive oil. Put a little pile of crab meat on to each pair of croutons, then place a stack on the surface of each bowl of soup.